The azured hare-bell, like thy veins." There is some debate as to what wildflower Shakespeare is referring to when he speaks of "the azured hare-bell". 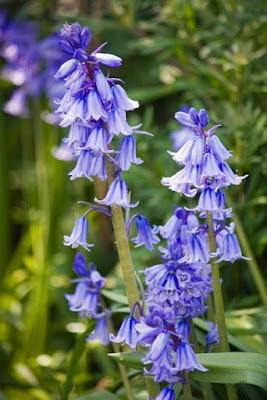 Some argue that he is referring to the English Bluebell (Hyacinthoides non-scripta), sometimes called the English Wild Hyacinth (Scilla nutans). However he may also be referring to the Campanula rotundifolia, which rather confusingly is also called the Harebell and Bluebell in different parts of the British Isles. The English Bluebell (Hyacinthoides non-scripta) is particularly associated with ancient British woodland where it grows profusely, creating beautiful carpets of violet blue. Almost 50% of the world's bluebells occur in the UK. John Gerard in his Herball (1597) and John Parkinson in his Paradisi (1629) call it English Jacinth, Hare-bell or Hare's-bell. It is also called Fairy Flower and Bell Bottle. The last part of its Latin name means unmarked or not written on, this was to distinguish it from the Hyacinth of Greek myth. This mythical flower was said to have sprung from the blood of the dying Spartan Hyacinthus. In his grief his lover the Sun god Apollo shed tears on the flower's petals which formed the letters AIAI, meaning "alas". As the English Hyacinth did not have these mythical letters on their petals they were "unmarked". Perhaps as a symbol of grief this flower is a more suitable choice within the context of the quote from Cymbeline. The other name of this plant, the English Wild Hyacinth (Scilla nutans) is not to be confused with the North American variety Camassia scilloides. The Harebell (Campanula rotundifolia) was also called Witch's Thimble, Witch's Bells, Fairy Thimbles, Dead Man's Bells, Aul Man's Bells, Lady's Thimble, Blawort, Milk-Ort, Hair-bell and Bluebell. 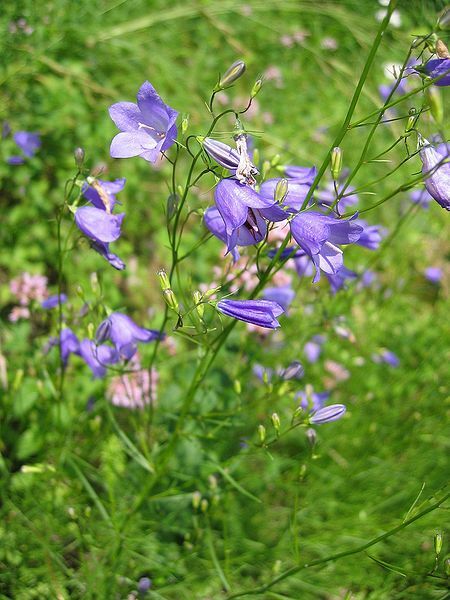 However as the names Harebell and Bluebell were often interchangeable it is sometimes difficult to discover whether it is the Campanula rotundifolia or the Hyacinthoides non-scripta which is being referred to. In Scotland Harebells and Bluebells are symbolic of constancy and everlasting love. In the rest of Britain they retain their association with death and grief and are often planted on or near graves. The flowers are also closely linked with fairy-lore. It is said that the ringing of the Harebells or Bluebells summons the fairy folk to their gatherings. It was also considered unlucky to disturb or pull up the flowers, or risk angering the fairies. Walter Gregory writes in Notes on the Folklore of the North East of Scotland (1881) that "The bluebell (Campanula rotundifolia) is regarded with a sort of dread, and commonly left unpulled." Likewise T F Thiselton-Dyer says in The Folklore of Plants (1889) "Among further plants of ill omen may be mentioned the bluebell (Campanula rotundifolia), which in certain parts of Scotland was called "The aul' man's bell," and was regarded with a sort of dread, and commonly left unpulled." This may explain why the flowers were also called Dead Man's Bells. Interestingly the Scottish "aul man" (old man) was another name given to the Devil. In traditional folktales fairies were often mischievous and dangerous creatures and therefore became linked with evil and the Devil. 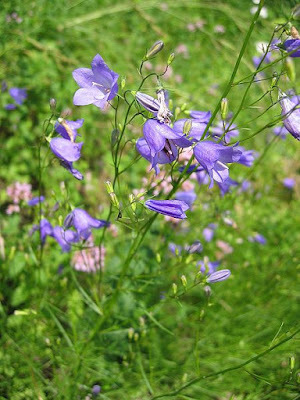 Harebells and Bluebells were also associated with witchcraft. It was believed that witches would transform themselves into hares and hide among the Bluebells. According to the Oxford English Dictionary the name Harebell derives from the flower growing in places frequented by hares. The first written record of a witch turning themselves into a hare was in Gerald of Wales' Topographica Hibernica (1184) where he writes "It has been a frequent complaint, from old times, as well as in the present, that certain hags in Wales, as well as in Ireland and Scotland, changed themselves into the shape of hares, that sucking teats under this counterfeit form, they might stealthily rob other people's milk." This may explain why Harebells were also known as Witch's Thimble and Witch's Bells. 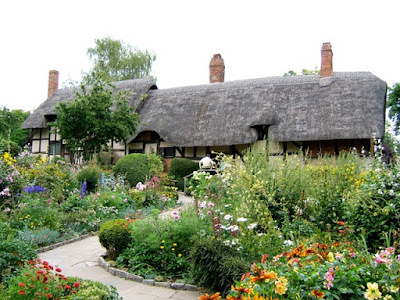 For a Shakespeare Garden it is a personal choice as to which flower you may wish to include. © 2018 E White. Simple theme. Theme images by Nikada. Powered by Blogger. A Shakespeare Garden is a participant in the Amazon Services LLC Associates Program and Etsy Affiliate, affiliate advertising programs designed to provide a means for sites to earn advertising fees by advertising and linking to amazon.com and amazon.co.uk and etsy.com.